Disclaimer: I did get permission from my daughter to write the following story. And I’m now down one quarter. Totally worth it. Additional Disclaimer: I did have more camping info to share, I just became slightly disgusted with myself after realizing that most of my really great camping tips actually came from you all long ago, when I first asked for camping advice. The mind. It is a terrible thing to allow to rot. My girls love to volunteer at church. I support this endeavor wholeheartedly as it alleviates any guilt I might feel about NOT volunteering at present time. I put in many many years teaching Sunday School, as well as a good 4 or 5 years leading an Awana group. I felt the need to stop when I developed a distracting tic. It seems that between homeschooling and volunteering at the children’s department at church, I may have spent a tad too much time around children. I took refuge in one of the empty classrooms on Saturday night, as we arrived at church early for the girl’s volunteering duties. I took the opportunity to grade the previous weeks schoolwork, as I’ve discovered that there are not nearly enough hours in the day for me to get everything done. The children’s pastor walked by and spied me in the classroom, “AHA, I KNEW WE’D WEAR YOU DOWN AND GET YOU TO VOLUNTEER!” I chuckled, “Oh no, my friend, THAT COULD BRING DOWN THE ENTIRETY OF THE CHILDREN’S MINISTRY!” And I’m not even kidding. So I send my minions to do my bidding. Anyhoo. Bright and early on Sunday morning I pulled up in the church parking lot to deposit the teenager for duty. I had stopped at McDonald’s to pick her up a Sausage Burrito as atonement for the lack of breakfast options in our own refrigerator. After eating, and before facing anyone publicly, Emme has a ritual of flossing her teeth. Since she’s used to eating in the car, she keeps a spool of floss in the side of the door. I sat chatting with her in the van during the morning flossing ritual. It was a one-sided conversation though, as Emme seriously gets into the act of flossing. She is thorough. I’ve worried that she might swallow her whole hand at times. It’s the little parenting moments that bring me the most joy. 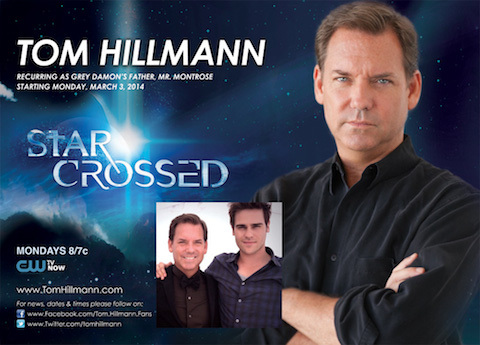 I may have mentioned late last year that Fiddledaddy, the actor, had begun working on a new show called Star Crossed for the CW network. He plays the dad of one of the leads, Grey Damon. Grey is a very nice young man who my teenaged daughter likes to refer to as her “hot older brother”. Anyhoo, the show began airing a couple of weeks ago. Fiddledaddy’s episodes begin airing next Monday night. SO EXCITED! I watched the first two episodes and will admit that I’m loving the show. And I’m not biased at ALL. Fiddledaddy’s story arc will carry over at least 4 episodes. But keep watching them all. Is he a good guy or a bad guy? I could tell you what I know, but then this blog would self destruct. They don’t even tell him anything until he gets a script. He doesn’t even not know what happens in the episodes he hasn’t appeared in. Top secret stuff. We’re hoping that with the power of social media, this show takes off and gets picked up for a second season. So if any of you all are social media savvy, and you like the show, we’d love it if you could help get the word out. Follow him as he tweets out exclusive stuff, and retweet him. 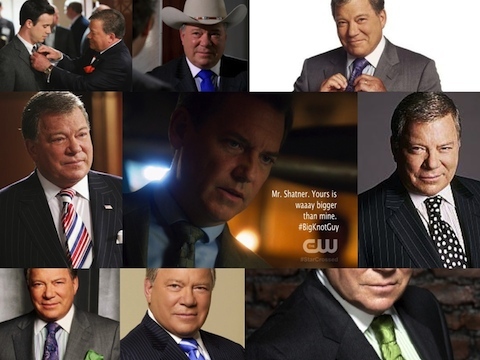 His Facebook page also has a sharable eFlyer you can share on your timeline. Do I have any idea what I’m saying right now? No. I suddenly gave myself and technologically induced hot flash. So far we’re able to let our two older kids watch, but I will warn you that there is some language. I really don’t know about mature themes and content for the 17 and younger crowd, I would definitely police it before letting them view the show. My parenting book will be forthcoming. If you’re not a fan of “Doctor Who,” this post will make no sense at all. 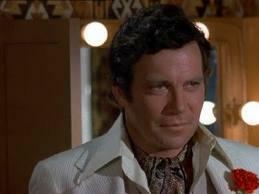 And if you are a fan, I’ll be careful not to reveal any SPOILERS. Which that in itself, is a spoiler. As a family, we’re fairly new Doctor Who converts. I had never heard of the show until my friend, Jenny, enlightened me. Doctor Who is a television show on the BBC that we were able to access through the magic of Netflix. The show originated many years ago and was brought back as a series of specials. It was then picked up in 2005 and continues to this day. Doctor Who is the continuing adventures of The Doctor (no one knows his real name, well, there may be one person, but once again, SPOILERS) who is a Time Lord, traveling through time and space in his TARDIS (code for blue Police Public Call Box) battling evil and avoiding the destruction of the universe. The Doctor is around 907 years old, give or take, and he never really dies, he simply regenerates. 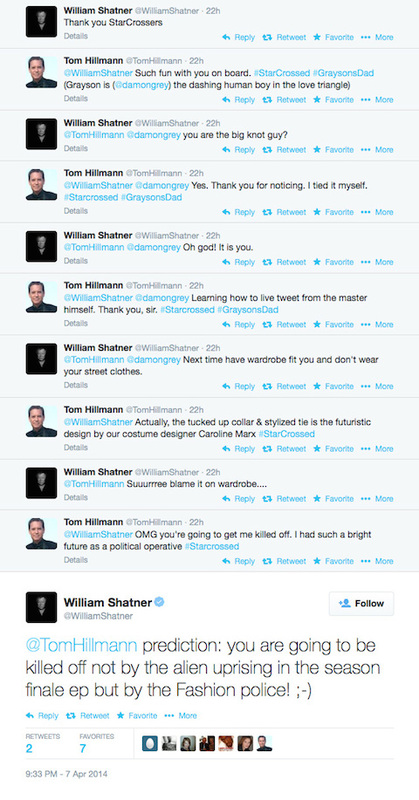 Thusly allowing a new actor to assume the role once the previous Doctor’s contract expires. Same Doctor. New face. My children were the first to get hooked. I would occasionally catch a few minutes here and there, and soon I found myself mesmerized. But woefully confused. So I had to start from the first season, on the first episode entitled “Rose” which featured confusingly, the 9th Doctor. I have to admit that I get attached to the at-the-time-current Doctor in question, and then when he “regenerates” and a new actor assumes the role, I think THAT’S IT, I’M DONE WITH THIS RIDICULOUS SHOW. 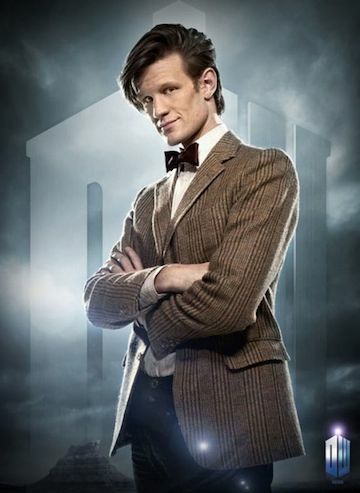 But then I like the next doctor better than the one before. Fickle. That’s the word you’re looking for. The Doctor travels with companions. He typically doesn’t prefer to be alone, so he makes friends along the way. And they share in his adventures. From a parenting perspective, the only drawback is the occasional use of the H-E-DOUBLE TOOTHPICKS word. But that’s it. I’ve warned my children that if they ever utter that word and it’s not in the context of the Bible, that’s it. Their Doctor Who days are O-V-E-R. I am currently on the 11th Doctor, the beginning of season 6, with his faithful companions, Amy and Rory. This cast is my favorite so far. (But Donna holds a special place in my heart.) My kids are ahead of me, but I’ve threatened their very lives if they should divulge any spoilers. 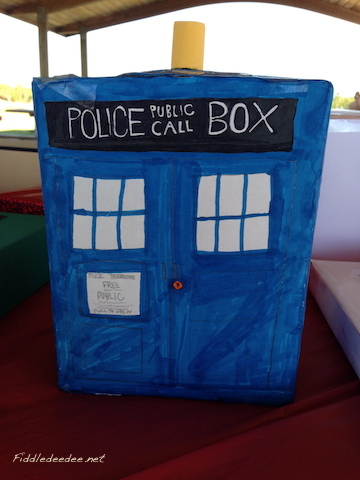 Cailey got into the spirit of Doctor Who by creating a TARDIS Valentine’s box for a recent party. 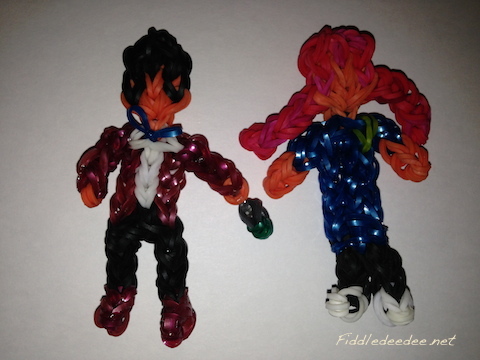 And she just created the 11th Doctor and Amy Pond Rainbow Loom figures. I think she has an artistic future. Any other Doctor Who fan-atics out there? Who is your favorite Doctor and/or favorite sidekick? A couple of years ago our American Heritage Girls scouting troop had a Father/Daughter dance themed “Duck Dynasty.” I have to admit that I had absolutely no idea what they were talking about. Some friends filled me in and I sent Fiddledaddy off bedecked in flannel and camouflage. Still, I was perplexed. Because we got rid of our cable and instead erected an antenna on the house (only because the coat hanger and foil were unsightly), I had never seen the actual show. I knew the basic premise, but had not fully experienced Uncle Si, Phil, Willie, Ms. Kay and the gang. Then the A&E controversy exploded after the GQ interview, which I have to say in my heart that I believe was a calculated move on A&E’s part because YOU CANNOT PAY FOR PUBLICITY LIKE THAT. And sure enough, I was curious. We were able to pull up the first season of Duck Dynasty through our Wii on Amazon Prime (free). And I watched. And I laughed until tears flew from my eyes. 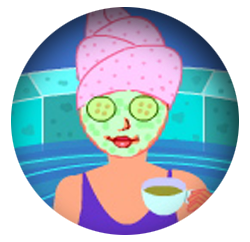 I can close my eyes and listen to Ms. Kay talk and I SWEAR I’m hearing my sweet Aunt Audine. I know I know. Reality TV. Mostly scripted. 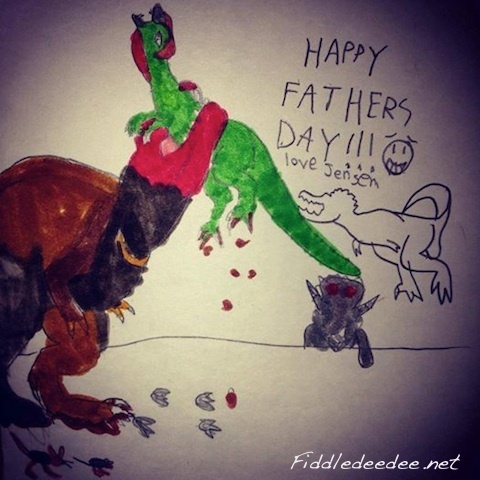 But good golly, I love that family. We have Seasons 2 and 3 on hold at the library. It may be awhile, we’re way down on the list. Lots of our neighbors evidently have the same plan. Anyhoo. The point of this post. I KNOW. A POINT. How novel. Jensen and I were in WalMart a while back and noticed a Duck Commander Wine display. “MOM, we’ve got to get THAT for Dad.” I thought I’d check with him first to see if he was game. I mean, we saw the “we just bought a winery” episode and the sight of Uncle Si stomping grapes with his bare feet was seared into my frontal cortex. Time went by and this week I sat putting together my WalMart shopping list. Jensen loudly reminded me, “DON’T FORGET THE DUCK DYNASTY WINE, MOM!” Thereby solidifying our redneck status. I just caught sight of Fiddledaddy trying to unscrew it, since that’s what you might expect from Duck Commander wine. Alas, a corkscrew was dispatched. Fiddledaddy has deemed it delicious. And it’s less than $9.00. No, I haven’t tried it. I don’t know good wine from bad wine. I was ruined in my impetuous youth by Mad Dog 20/20. 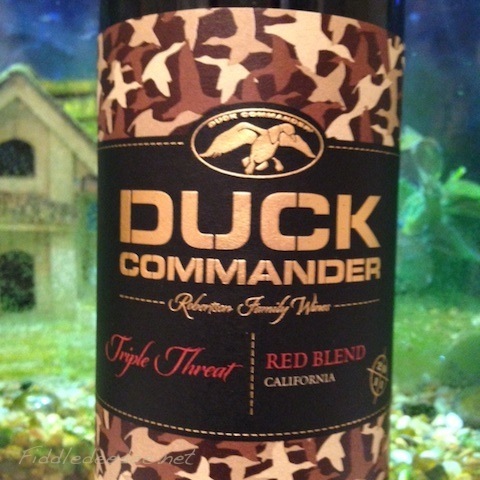 One thing that I appreciate about the sale of this wine is that it has been put out by Duck Commander, so the profits belong to the family business.